Defeat the giant spiders and escape the perils of Mirkwood Forest! Follow Fili the Dwarf and Kili the Dwarf deep into the dark and scary Mirkwood Forest on The Quest for The Lonely Mountain. Attack the heroes with 3 small spiders and 2 giant spiders with glow-in-the-dark eyes and trap them inside cocoon elements high up in the buildable tree. Use Legolas Greenleaf and Tauriel to save the day by battling the spiders and freeing the Dwarves with the tipping function before it’s too late! Includes 4 minifigures: Fili the Dwarf, Kili the Dwarf, Legolas Greenleaf and Tauriel, all with assorted weapons. • Imprison a minifigure inside of each LEGO cocoon element! Help the Dwarves escape from The Elvenking’s wine cellar dungeon! Help! The Mirkwood Elves have locked the Dwarves in The Elvenking’s palace dungeon! Use the Ring to imagine Bilbo Baggins is invisible to the guards, then steal their dungeon key to free the Dwarves! Hide the Dwarves inside of the barrel elements and trigger the barrel roll function to start escaping! As the barrels roll down the ramp with the Dwarves inside, bust the dungeon door open with the breakout function lever! Keep holding the magical Ring to imagine Bilbo Baggins is invisible as he pushes the Dwarves out of the palace and back onto their epic journey. Includes Bilbo Baggins and 4 minifigures exclusive to this building set: Gloin the Dwarf, Oin the Dwarf, Mirkwood Elf Chief and Mirkwood Elf Guard, all with assorted accessories and weapons. •Roll the Dwarves to freedom with the barrel roll function! •Steal the golden dungeon key from the guards! •Open the prison door with the breakout function! 1. Smaug is the creature with glowing eyes in the picture below, otherwise known a a dragon. He's described in the book as "a most specially greedy, strong and wicked worm"
2. Smaug lives in a prime piece of real estate known as the Lonely Mountain, which he captured from the dwarves. 3. Smaug loves his bling. He has slept for centuries on his pile of gold and gemstones, which have embedded in his belly. This mean he doesn't really have many soft spots to attack from as the rest of him is covered in rock hard scales. 4. Smaug gets annoyed if people steal his stuff. 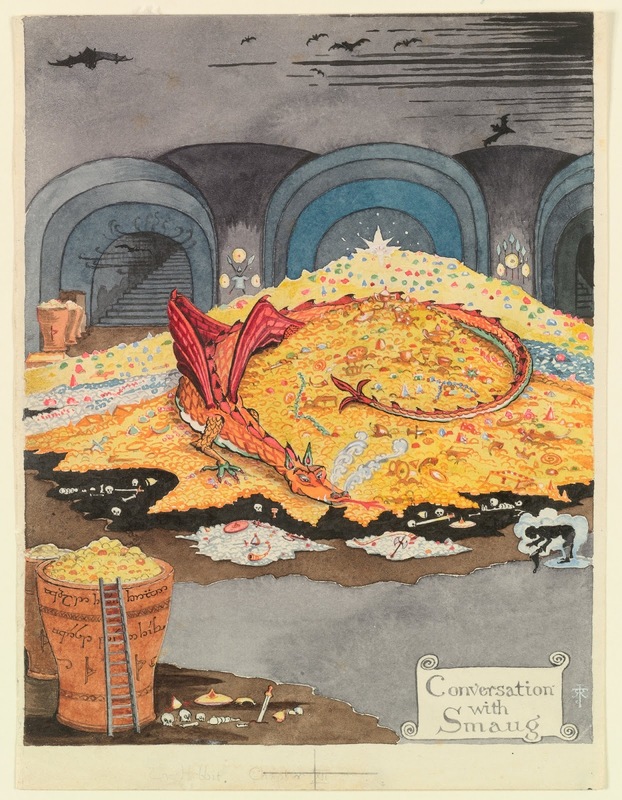 Tolkien writes Smaug's rage was the kind which "is only seen when rich folk that have more than they can enjoy lose something they have long had but never before used or wanted." Hyperintelligent red-gold dragon proving to be skilled Hollywood negotiator; tactics include speaking exclusively in riddles, threatening to charbroil recalcitrant studio execs. Demanded — and got — highly lucrative “gross points” for appearance in upcoming Peter Jackson Lord of the Rings prequel. Formal streak, known for complimenting even thieves and liars on their “nice manners,” yet short-tempered; three fictional reporters have gone missing in last year while attempting to assess the ancient wyrm’s “unassessable” wealth, count up his “countless piles of precious things” and scope out “unseen floors” of his lair. Distrusts banks, Wall Street; swears by “plunder and hoard” investment style. Featured in J.R.R. Tolkien novel The Hobbit. " What is the hobbit movie about? A hobbit called Bilbo, along with a group of dwarves go on a road trip to a mountain to reclaim it from a dragon called Smaug. The mountain belonged to the dwarves originally, they want it back, but its occupied by goblins and the gold hording dragon Smaug. After a Wellington premiere of their new film "The World's End," Peter sat down with Edgar Wright, Simon Pegg and Nick Frost to have a chat about the film WORLD'S END, and filmmaking. Excerpt: A day after saying goodbye to Gandalf and Tauriel, it was time to farewell Legolas. What a great day it was, with Orlando battling a serious Orc for all 12 hours of shooting - part of the Battle of the 5 Armies for the third Hobbit movie. When we finally got the day done, we said goodbye to Orlando, had a couple of beers ... and couldn't resist doing this! The trailer runs for 2:10 of action packed montages. It begins with an expansive pan of prime New Zealand landscape, with a voice over from Tranduil (the other blonde elf who is not Orlando Bloom) backed by haunting ethereal vocals. "Where does your journey end? You seek that which would bestow upon you the right to rule." Tranduil proclaims in his kingliest elf voice. More scenery abounds with CGI villages and mysterious shrouds of fog. "The quest to reclaim a homeland and slay a dragon." continues Tranduil. Followed by a close up of Thorin dwarf-king, whom Tranduil is talking to. Which is where we left off our dwarves and hobbit previously. Cut to a several actions scenes including a barrel escape which consists of dwarves/hobbits in said barrels plummeting into water. Juxtaposed by a peaceful scene of vibrant blue butterflies floating around Bilbo who you know, is just hanging out at the top of a tree. Chilling out. Beyond Darkness is displayed in gold capital letters. Orlando Bloom's Legolas pointing an arrow at the dwarf collective, specifically Thorin. "Do not think I won’t kill you, dwarf." scowls Legolas, who appears to have woken up on the wrong side of bed. Maybe it took Legolas longer then usual to get his hair straightening iron to work on his elven locks that morning, who knows why he's so angry? "When did we allow evil to become stronger than us?" half whispers Tauriel, the made-up elf warrior played by Evangeline Lilly. Later on while standing on the edge of a rocky outcrop (more beautiful New Zealand scenery) she responds to Legolas statement "It is not our fight" with "It is our fight." Presumably there will be more of a follow-up argument in the movie. Cue a hobbit sliding down a pile of cold coins and other treasures. Weeeee! Cut to Radagast (know to the masses as that weird wizard who had a rabbit driven sled), peering over Gandalf's shoulder asking "What if it's a trap?" Gandalf responds firmly "It’s undoubtedly a trap." Staff in his left hand, he unsheathes a sword with his right. Beyond Desolation is displayed in gold capital letters. Tranduil (the elf kingy) proclaims "Such is the nature of evil, in time all foul things come forth". True, like when you don’t clean the bathroom sink. Cue orc Azog (with paleness which indicates a vitamin D deficiency) appearing between the turrets of castle in time for the end of that sentence. He growls. Grrrr. Lies the Greatest Danger of All is displayed in gold capital letters. Bard the Bowman, played by Luke Even's warns Thorin "If you awaken that beast, you will destroy us all." Cut to what looks to be Gandalf having a brawl with Saruman. Next Legolas and Tauriel fighting miscelaneous goblins. Cue a loud boom and one of the dwarves asking "Was that an earthquake?" To which the ominous response is "That my lad...was a dragon." The Hobbit appears in Gold Letters. The dragon Smaug's head makes an appearance staring down Bilbo. “The Desolation of Smaug” will be in theaters December 13th and is the second part in the series, following on from “An Unexpected Journey."